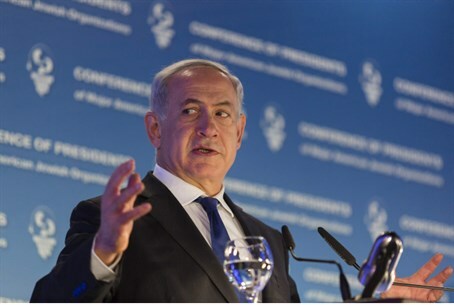 Those who call for boycotts of the Jewish state are "classical anti-Semites in modern garb," says PM Netanyahu. “In the past, anti-Semites boycotted Jewish businesses, and today they call for the boycott of the Jewish state,” he told a gathering of the Conference of Presidents. The Prime Minister’s comments come in the wake of repeated calls for boycotts against Israel, not just by BDS organizations but also by the European Union (EU), which recently published new guidelines boycotting Israeli entities operating beyond the 1949 Armistice Lines. Among the leaders of the anti-Israel BDS campaign are left-wing Canadian Jew Naomi Klein, Roger Waters of the band Pink Floyd and physicist Stephen Hawking. While the BDS movement sees some success, it has also seen quite a few failures. One such recent example was when actress Scarlett Johansson stepped down as an ambassador for Oxfam, after the group tried to force her to boycott Israel by not appearing in a commercial for Israeli company SodaStream.